Glassware and plasticware that are used for storage in laboratories should always be kept dry. 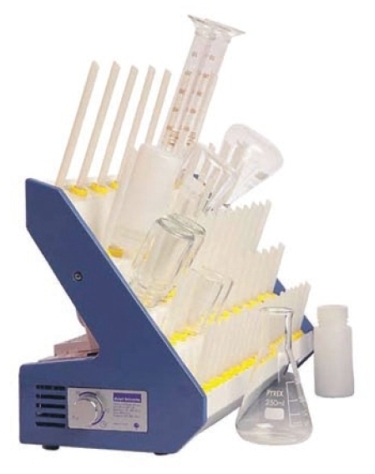 They may include test tubes, measuring cylinders as well as volumetric flasks among many more other equipments. The Nelldorn Dryer, made by Astell is a dryer that is both economical as well as efficient when drying the equipment for safe storage. Astell's Nelldorn Dryer comes supplied as a complete set. It has a timer that has the capacity to dry 60 items within 120 minutes. It does this by drawing a large volume of air over the thermostatically controlled heating elements by forcing the heat though each tube. The rapid flow of warm air dries the containers and apparatus quickly and minimizes the risk of damage. Though a lot of heat is produced, the process consumes very low power. This makes the whole process economical. It can be used in virtually all the labs inclusive of pharmacies. This is because it does not segregate between glass and plastic ware. Astell's Nelldorn Dryer has a big capacity. It can hold a maximum of 60 items in one go. If there are many items to be dried, it has the capability of repeating the drying process for about 15 to 20 times. The model is quick and efficient. It is free standing so you will not need to look for a surface for support it and the unit is controlled by a thermostat. it regulates itself so the chances of damage are minimal. It is fitted with 60 rigid stain resistant nylon drying tubes. They have an adjustable timer which can be preset to switch off once your desired time has been achieved. The maximum time that can be set is 120 minutes. The model has been designed to save on space. Once apparatus that have been placed in it are dried, they are systematically removed from the dryer. This is through the stepped design that allows zero disturbances to the remaining load. It also helps in draining the water through a pipe that avoids accumulation at the base. At the back unit air intake is recessed. This allows it to be free standing and can be mounted on a bench or a wall.